The rag tag bunch of heroes (with special mention to pro wrestler Dave Bautista for his portrayal of the drole Drax) take on the imperious Ronan The Accuser (Lee Pace) in James Gunn's sci-fi adventure. 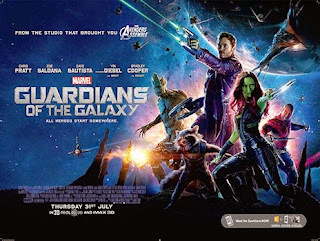 The film's wit is matched by the excellent soundtrack (itself a plot point) and while the action set pieces can be a tad haphazard, writer-director Gunn injects 'Guardians Of The Galaxy' with sufficient momentum to ride any rough edges. Arguably, Rupert Wyatt's 2011 'Rise Of The Planet Of The Apes' was more of an unexpected success than 'Guardians Of The Galaxy'. Matt Reeves took the helm for the latest installment, pushing things forward in a bold fashion - much of the film is either silent or subtitled, focussing on the world of the apes. It's a compelling move, and one which pays off, despite the somewhat predictable manner in which the plot moves toward the latter half of 'Dawn Of The Planet Of The Apes' (★★★★). Ten years after the collapse of society, the returning Caesar (Andy Serkis) now leads a community of apes in the woodland. Unexpectedly encountering a small band of humans, on a mission from their larger habitat in San Francisco, the two groups eventually find themselves bound by a fragile peace - inevitably shattered by foolish moves from both sides, a moral see-saw that allows for empathy for apes and humans alike. Gareth Evans's Indonesian cult hit 'The Raid' wowed audiences, despite a relative lack of anything but hard-hitting action. Evans ups the ante in all regards for his sequel, out now on DVD, signalling his intentions by disposing of a character from the first film within the opening scene. Iko Uwais returns as Rama, this time going undercover in a bid to take down corrupt officers and the local crime syndicates. 'The Raid 2' (★★★★½) is an improvement on the first film in almost every area, including the famed action set pieces - a fine crime drama. Maxamillian FG was on hand to review Korean postmodern-fictional-documentary 'Behind The Camera' recently. The film was made in 2012 but it's taken until now to swing over to the UK home cinema market, via the consistently excellent Third Window Films. Nothing written here can express the universal sadness shared upon hearing the news of Robin Williams' passing. Aged 63, he left with iconic roles in the likes of 'Aladdin', 'Dead Poets Society', and 'Good Will Hunting'. His work in 'Toys' and 'Hook' particularly, while far from acclaimed, meant a great deal to me, and I look forward to revisiting his back catalogue and savouring every moment. Lauren Bacall was another Hollywood great to sadly pass away this week, becoming a formidable actress following her initial career as a model. "With deep sorrow, yet with great gratitude for her amazing life, we confirm the passing of Lauren Bacall." In much, much sillier news, it turns out the new Terminator film is called 'Terminator Genisys'. Yeah, actually spelt that way. A scheduled release date for Arnie's return to robotic ways is July 1st 2015.